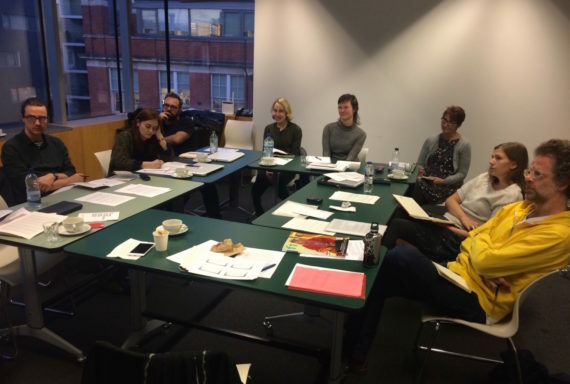 As a follow up to the second a-n Writer Development Programme workshop at Jerwood Space, led by Fisun Güner, the writers were tasked with writing an 800-1000 word profile of one of the three artists featured in Jerwood’s 3-Phase exhibition. Edinburgh-based writer Jessica Ramm chose to profile Larry Achiampong. This collection of music would later provide audio samples to be used “either to expand upon the space from whence they came, or be transformed to take on a different form”. His working and reworking of this material is emotional and intuitive, a way of keeping in touch with his identity while conveying the excitement he remembers from his youth: an era during which he was “surrounded by people who were really into sound: people who were using cheap bits of technology to do bedroom audio production”. Though Achiampong’s current exhibition as part of Jerwood 3-Phase is his first solo presentation, he has a prolific back catalogue of works including his presentation as part of the Diaspora Pavilion at the Venice Biennale, a performance at Tate Modern, a residency at the British Library and a vinyl LP, More Mogya, released in 2013. For Achiampong, the gallery is a testing ground, a space in which he re-presents material drawn from his experience of growing up in East London to Ghanaian parents. Achiampong and Blandy’s conversation at Whitechapel quickly developed into a collaboration which is ongoing. Though their experiences of growing up in London were very different, being black working class and white middle class respectively, they are united by a shared appreciation of the video games, films and music that provided immersive virtual environments in which they played as children. They went on to form a hip-hop crew called Biters, which Blandy describes as a way of talking about authenticity and appropriation: “We would steal rhymes and beats and re-present them in white cube spaces.” The Tate’s website describes Achiampong and Blandy as investigating “the self as fiction, devising alter-egos to point at their divided selves” in their work together, which includes “digital imagery, exhibitions, performance and video”, as if they are triumphant computer game heroes. 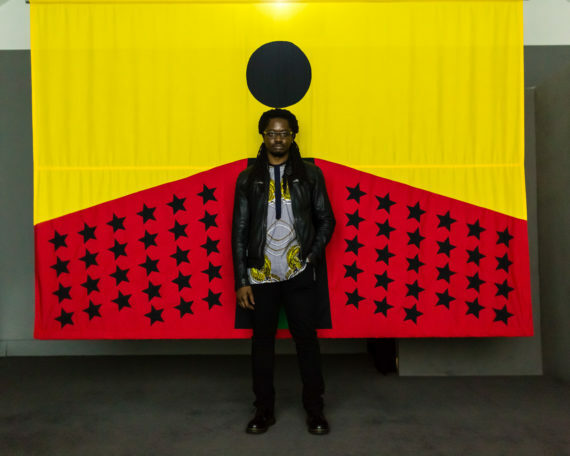 Achiampong’s power as an artist is in his ability to proliferate numerous versions of himself, populating virtual reality as well as culturally framed spaces of real life, such as lecture halls, newsstands and exhibition spaces. Each of these avatars has the potential to vanquish an assumption or stereotype of what it means to be a man of African descent living in the UK today. Rather than attempting to undermine the cultural narratives that linger on as the UK works through its colonial hangover, Achiampong draws dynamic energy from the community in which he grew up. Arts Admin describes his work as a response to the idea that while the sharing of information via the internet continues to expand, “a conservative version of history, as previously dictated, continues to be eradicated”. Since he was a schoolboy, Achiampong has been aware of how narrative can be shaped and re-shaped depending who’s writing the textbook. He remembers “slavery being taught like it was an actual trade, a trade in the sense that Africans got something in return and it wasn’t this aspect of atrocity”. By creating his own avatars, he avoids stepping into the clichéd persona that society is still ready to bestow upon him. 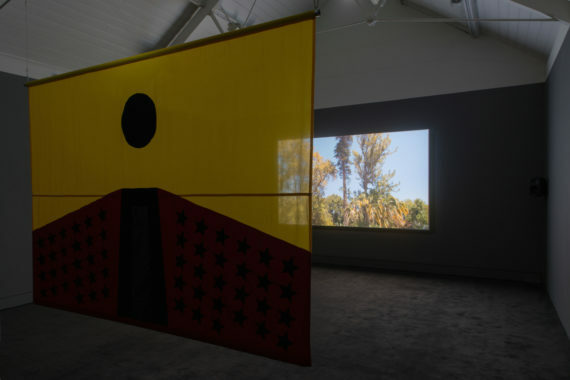 3-Phase continues at Jerwood Space, London until 10 December 2017.